Okay, here is one concrete example I thought of. I use Synaptics for my PC touchpad. It allows me to customize the trackpad buttons for ergonomics and use gestures to control the mouse (great app overall). Its not built into the Windows OS, but its a great standalone, like is normal for a Windows PC. It works on a 2" touchpad with four buttons and allows me to use the trackpad "sideways" so I'm not tweaking my wrist all day. This is a case of poor physical design and OS design. On other laptops, I have had similar issues with the tracking characteristics - the tracking can be inconsistent, you need to keep in mind where your fingers are to use the scrolling capabilities, etc. Also, Synaptics will sometimes crash when I open the computer from sleep. I don't really care where the issue lies, it happens, clean reinstall couldn't fix it, causing a small inconvenience. I have a shortcut to restart it when it happens. Now, with the Mac, the touchpad is much larger in size so I can run the mouse with less pickup, there's multi-touch from Apple directly, and the whole thing is a multi-use button. I don't have to worry about where my fingers are on the track pad to do things like scroll or double-click, my hand orientation to hit critical buttons, tracking works better, and nothing has ever crashed. This is one example of both better physical design, better integration of systems, less hassle to me. The Apple comes out of the box with more functionality and reliability. When you have to piece together things to get to that, you inevitably run up costs (3rd party software) and lessen reliability (3rd party clash that doesn't get tested). When Synaptics stops working on my PC I know how to resolve the issue in seconds, but originally it took some time to try and fix it, hours for a reinstall over one rather insignificant issue, and an eventual home made workaround. I see the value in not having to put up with that, and lots of other little things like that. Beyond that, simply using a larger track pad without a rigid orientation has health benefits as its more ergonomic. There is more thought put into daily use and what people call workflow than with your basic PC. Valid points for your user style, but ultimately the issue you are describing is one of ergonomic design unique to the laptops you have used and less of a general PC flaw. Again, I would never argue that they aren't a better choice for some people based on needs and use. However, the fact that they are better for some does not make them "better" overall. I was also thinking about the car analogy. Another analogy might be a Camry vs Lexus ES. They are for anyone that doesn't know, the same basic car. Under the skin, same components, suppliers, etc. The Camry can even be priced on par with an ES, but the Lexus has inherent value that you pay for and may not see up front. Of course, some people just see them as basically the same and would never buy an ES when the same basic car can be had without some bells and whistles for less money - they don't recognize or don't care about the inherent value in things like a nice service center, better materials vs good enough, high focus on customer service, valet service, etc. A much better analogy for sure. When it comes down to it, there is nothing about the Lexus ES that is measurably better than in a Camry. They have the same power, handling, ride quality, etc. What the guy in the Lexus is paying for is the Lexus name, Lexus styling and some nicer interior trim. Some will justify the price of the ES based on the perceived quality of the brand and the fact that the package looks better and feels nicer to interface with. However, that doesn't change the fact that the guy in the Camry is going to go just as fast at the drag strip or around the race track. Who cares about the cost? Big deal, you have spend $500 more or less to make yourself satisfied with your purchase. $500! It's not enough money to consider when purchasing a tool that will make you more efficient and overall happier. We're talking about the valuer of a nice dinner, or half a day's work, or a weekend at your country club. With a computer, "better" is defined by which can help you get more done the way you want to get it done. Not the petty cash of difference in price. The result will vary person to person. I always suggest that people stick with what they like. Who cares about cost? Who doesn't care about cost? If you're someone that earns $1k a day and routinely drops $500 on dinner or greens fees than no, you may not care about $500 here or there. However, most people do care and that is a lot of money. That's why I say, if you can justify the $500 do to the Mac being a better fit for you, great. As for me, I'll buy a second computer for the kids. We've thrown barbs back and forth about this before, but maybe we can try and keep it civilized this time (mensa and Tek, get more popcorn and beer, lol). You both state that the cost differential between a PC and Mac is either negligible or that "high quality" PC's cost as much as a Mac. I would like to know what exactly defines "high quality"? Is it based on components? How those components are put together? I can laboriously list the MSRP of various PC's vs. their Mac counterpart to prove that there is a large price difference, however those often get dismissed. So, what makes a Mac with the exact same hardware as a PC more "high quality". What justifies the increased price? I'll give it to you that Mac has superior customer service and better warranties than the vast majority of PC builders. I'll even give it to you that they make a more physically attractive product than the majority of PC builders, but all of that amounts to "soft" reasons that have nothing to do with actual performance of the computer. I get that some people feel that the service, warranty and the OS are worth paying sometimes upwards of $1k more for a Mac, but both of you routinely argue that there is real performance difference, I just don't see it and either do the vast majority of people more than casually familiar with computers. My point is: There are low-priced PC's and high priced PCs. Macs are high priced, and their quality is quite good, too. The same for some of the more expensive PC's. To me a high quality product is long lasting and well built, regardless if it's a PC or a Mac. When I buy a Mac I expect it to last for quite a lot of years. I will give you that Mac's are well assembled, but the sticking point for me with your argument is the implication that their hardware bits are of some sort of higher quality than what is found in regular PC's. The Intel processor and motherboard in the Mac is no better than the same one in a PC. The graphics card, RAM, hard drive, etc. are no better than the same components in a PC. Take the earlier Alienware example. Alienware bolts together a nice system, but you can easily buy something that replicates the Alienwares hardware for much less. That brings me back to the only obvious conclusion that whether we are talking a high end PC or Mac, the reason for the increased cost has nothing to do with the actual hardware and performance, but things like a warranty, customer service, company name, etc. If people want to pay more to get those things, then more power to them, but don't represent the product itself as superior. To me a high quality product is long lasting and well built, regardless if it's a PC or a Mac. When I buy a Mac I expect it to last for quite a lot of years. Most computers don't break down. Hard drives might crash every five years or so (which by then it's almost a good enough time to upgrade the whole computer anyway). Keyboards and mice get broken up but those are $10 replacements - big deal. Monitors start to degrade but after a few years you can buy a much better monitor for less than you paid for the replaced monitor. Moore's Law makes it unnecessary to buy a computer that will last a long time. Intel GMA x4500 integrated graphics. 16x dual layer DVD (+/-RW) drive. $399.99 on sale, for a $300 savings. $499.99 regularly for a $200 savings. Dude, what part of "exact same or better specs " did you not understand? You seem to be incapable of even matching up specs. Here is what I came up with. If I configured it wrong, tell me were I'm wrong. Limited time offer :3 years for the price of 2 ! 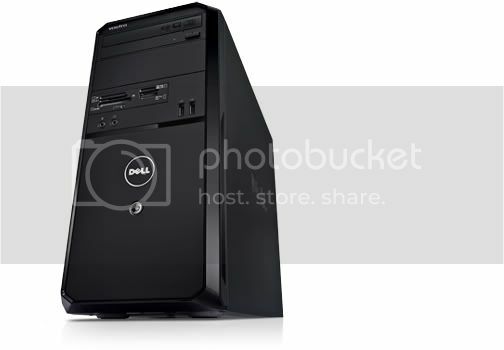 Save $238 on select Vostro 230MT Desktop through Dell Small Business. MSRP $832 vs $699 for the Mac mini. Even with Dell's special price you would only be saving a $125 (personally I'd just get a refub Mac mini for about the same price as the Vostro. And what do you get for your $125 savings? Dude, what part of matching up specs don't you understand. The bundle you quoted above, includes a monitor, at the $574 price point, something that doesn't come included with the Mac Mini. As for the actual processor/memory specs, they are pretty much identical in terms of computing power. There are other attractive options as well from both Lenovo (Thinkcenter M70E) and Acer (Veriton VX275). Both of these use a more powerful processor, better video, more RAM and larger hard drive and come in at around $550. As far as actually getting the exact form factor that the Mini uses, well that is harder. There are companies that make them, but they ring in slightly more expensive than the Mini. If we went the HTPC route, you would get something more similar, but most of those only come with Intel Atom processors. So, out of all the examples I countered on, the only one you could really critique was the Mac Mini? I've proven you can get the same performance for less money in that case, it's just that you can't get it in the same tiny little box. Edit to add: Many of the systems I chose have cheaper equivalents with equal performance if I was able to select an AMD processor. However, the deal was to go spec for spec, so I stuck with Intel. No matter how you dice it, I feel I was able to prove that there are much cheaper PC counterparts to every Mac and I only spent about 20 minutes looking for them. My point was that everyone is focusing on pricing rather than value. If a Mac helps you get what you need to get done better, then it makes sense to spend the extra dough. Reality is that most people have a preference in what they want to use. Sure, Macs are a poor value if you only take into consideration the hardware power vs the $ spending, but there's more to it than that. $579 for a savings of $420. FAIL again on specs. This would be comparable to a MacBook, NOT to a MacBook Air. I can't find any Asus models to compare to an 11-inch MBA. $649 for a savings of $350. That said, it's a good match to a MacBook. Backlight display, Multi-touch track pad compare nicely to the MacBook. Unfortunately the design and the build quality are just not there. All you have to do is read the reviews to see that. Here is my configuration to compare with the MacBook. Again, if I'm wrong tell me where. So it's a $280 savings, of the price of a MacBook. What do you get for it? Considerable lower build quality. I always tell people to go to a local Apple store and just try the computers out. Many people experience a Mac and end up buying and being very happy with them. You start laying out specs like this and most people's eyes glaze over.